It’s a Nevada history book like you’ve never seen. 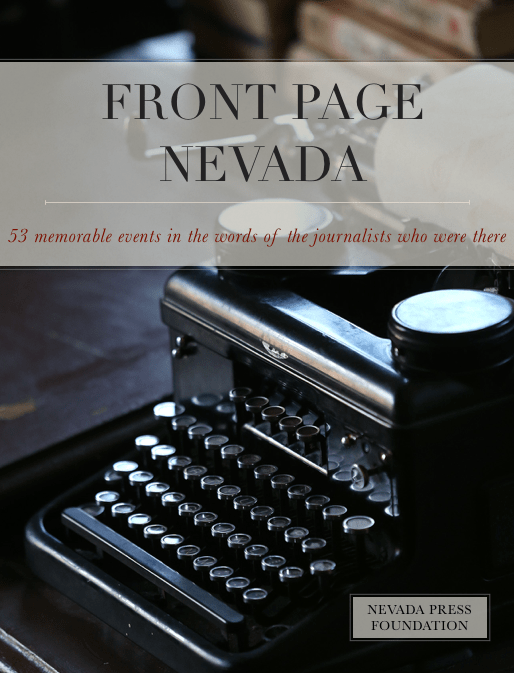 ‘Front Page Nevada’ brings together 53 front-page stories from the state’s newspapers to tell the history of the state from the people who were there — reporters and editors writing the first rough draft of history. As an e-book, it includes videos, interactive links and a quiz at the end of each chapter to see how well you know Nevada history. The book is intended for Nevada students and, with the help of the John Ben Snow Memorial Trust, is being offered free to all students for a limited time. There’s also a PDF version which will work on any device, but it doesn’t have all the bells and whistles of the iBooks edition. We’ll be formatting it into a more universal e-book format in the future, so that it will be available on more devices. The stories were compiled by the Nevada Press Association for Nevada’s sesquicentennial, and you may have seen them reprinted in newspapers throughout the state. Now, with ‘Front Page Nevada,’ they are pulled together in one fascinating book. Do you know the story of Austin’s traveling sack of flour? Do you remember the Beatles in Las Vegas in 1964? Have you been to the camel races in Virginia City? Easy to read, with interesting twists in every chapter — these are the stories that told the news when it happened. Before it was history.